I find I always feel more dressed up when I’m sporting some nice nail polish. My pet peeve is when it chips! I’m hard on my nails with working all day at the computer, cleaning my house and taking care of my kids. I usually have to fix them every 3 to 4 days sometimes sooner depending on what I was doing. If I have to leave the house to go to the store with my polish chipping off, I always feel self-conscious and wonder if the cashier or the people in line behind me notice my nails in need of some TLC. I don’t mind doing my nails and am getting better at applying nail polish the more I practice. I only started wearing it regularly again in recent years and there was a bit of a learning curve to get back in the game. Painting my right hand is still tough though! I experienced two more firsts recently – trying out a new brand of nail polish, Madam Glam and painting my nails with UV gels! I hadn’t heard of Madam Glam before, but learned that they are based out of the Fashion district in New York and are growing in popularity. Madam Glam is sold exclusively online and I was excited to see that they do ship internationally. Madam Glam nail polishes are 5-free. What this means is that they don’t contain any Toluene, DBP, Formaldehyde, Formaldehyde Resin and Camphor. Try and say that three times fast! Also, their products are cruelty-free and never tested on animals. 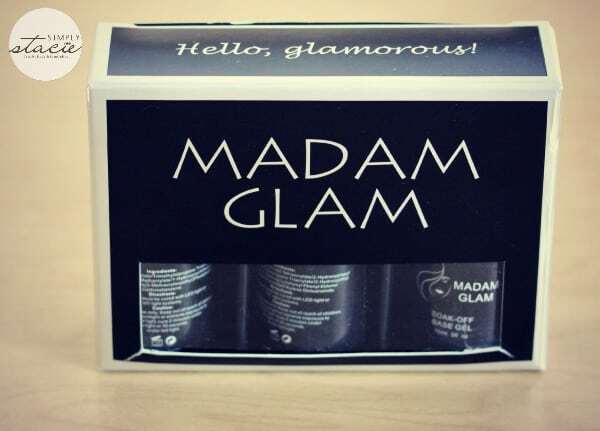 I had a peek at the Madam Glam reviews online and was impressed by what I saw. I was really looking forward to trying Madam Glam and to see how easy it would be to apply and how long the colour would last. Madam Glam recently launched their line of UV gels and invited me to test them out. They sent me three products: Soak-Off Base Gel, Soak-Off Gel Polish in Lilac and Soak-Off Top Gel. Note: you’ll also need either a UV lamp or LED lamp to use the UV gels. I didn’t have one so I picked one up on Amazon.ca. They also sell them on Amazon.com for the US folks. 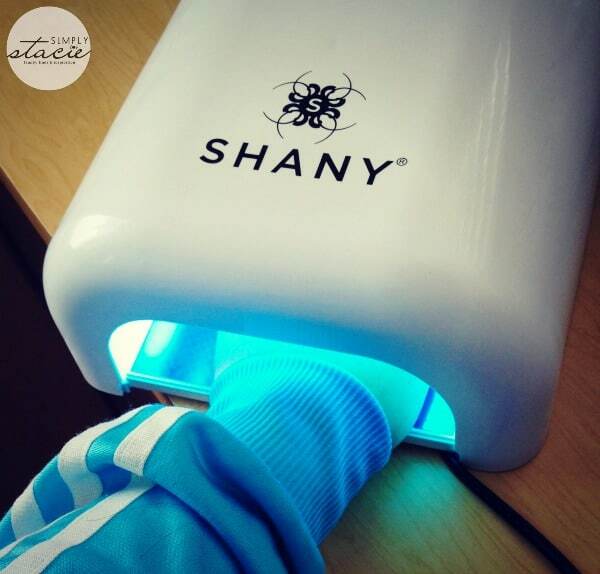 A UV lamp is needed to cure the nails. Curing time is 2 minutes by UV lamp or 30 seconds with an LED lamp. I was a excited and a little nervous to test them out. I had no idea what to expect since I’ve never tried gel polish before nor had I ever used a UV lamp. Like I said before I’m a newbie! 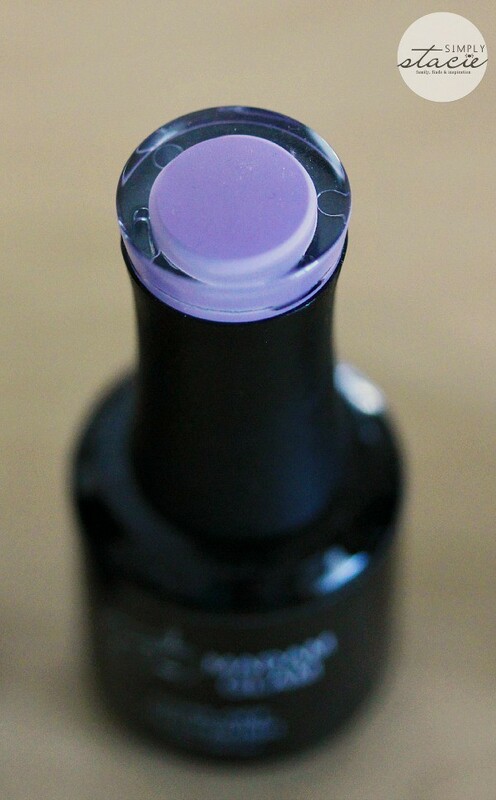 After preparing my nails by cutting hangnails and pushing back cuticles, I applied the Madam Glam Soak-Off Base Gel. It provides the foundation for the gel application. I applied one coat to each nail and held my hand in the UV lamp for a full two minutes. I played a game of Candy Crush on my phone while I waited for the timer to go off. Multi-tasking! The next step is the fun one – the colour! I was curious to see how it would look on my nails. 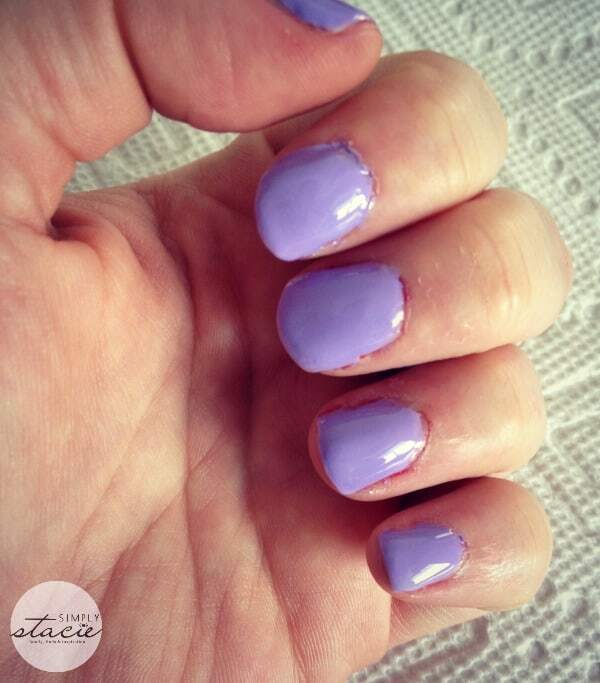 As you can see from my pictures, the colour is shown at the top of the bottle and is a pretty lilac. I picked this colour because it was soft and feminine. As I was applying it I noted how easy it went on. I was surprised I didn’t get any on my fingers because normally I mess up at least one finger. It was seamless to apply. After applying the first coat, I could have probably been fine to continue on with the next step. The colour was smooth and covered the nail nicely. I ended up doing two coats since that is what I normally do and I didn’t see any instructions saying how many coats to apply. I used the UV lamp to cure between each coat and played some more Candy Crush (I’m stuck on Level 377)! Lastly, I applied the Soak-Off Top Coat Gel to protect the colour and keep it shiny. When I was done, I noticed my nails felt a bit sticky. I learned this is normal and you need to wipe them off with some isopropyl alcohol. Once I did that they were smooth and shiny and completely dry. What especially shocked me is that days later my nails still looked great. The colour is vibrant and they were glossy and smooth. The best part is no chips. This gel polish is GOOD! It’s worth the extra effort of using a UV lamp. The application can last 3 to 4 weeks. I wish I would have been able to wear Madam Glam for my sister’s wedding back in 2006. We had our nails done at a salon. My polish peeled off in the car ride home! I was so mad. If John and I ever tie the knot, I’m wearing some UV gel polish for our wedding! I wasn’t sure how to take off the gel polish so I asked Madam Glam. They told me to use regular acetone and shared a link to a video review demonstrating how to do it. Fast forward to around the 20 minute mark to watch her remove it. Now I need to start building up my Madam Glam collection! I’m thinking I’ll try a pink next or maybe a soft green. Decisions decisions! Have you tried gel polish before? Connect with Madam Glam on Facebook, Twitter, Instagram and Pinterest. It’s very seldom that I paint my nails, like you I hate it when it chips or starts to peel off. This gel looks interesting but it also looks rather thick, is it or is that just an impression that I got? I am not familiar with Madam Glam and I have never tried UV gels before. A polish that lasts 3 to 4 weeks? I have got to give this a try. Thank you for sharing this review. Thanks for the great review.I have never tried gel uv but I like the lookof it and would like to try it. My hands are a disaster and I should probably get a manicure for the holidays. 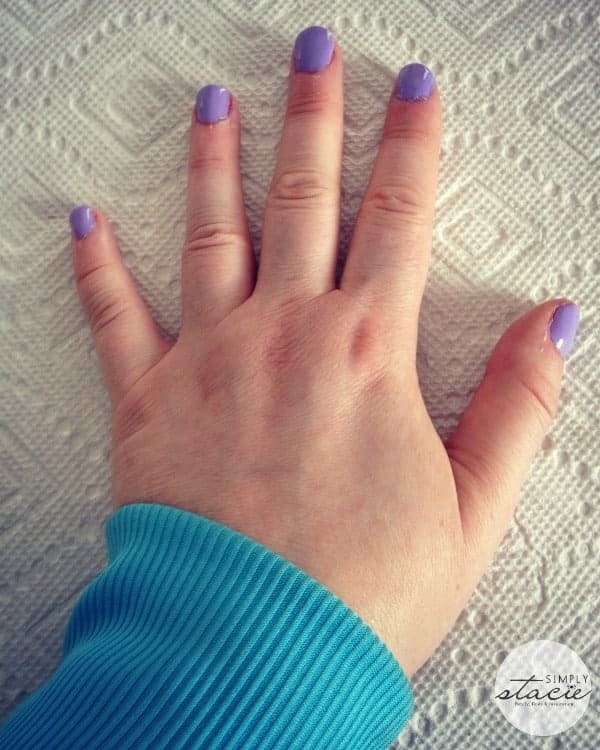 I hear that gel polish lasts a lot longer == I love your lavender polish! I tried professionally done but never at home. How beautiful yours look though! That is a great color – opaque, glossy, and lasts. I love that she has many colors to choose from. Thanks for the review. I would be a little nervous, too, doing the UV light, but you did a great job. Sounds like some nice nail polish. I too have not heard of madam Glam before, but looking at how pretty your nails look with that Purple Gel polish, looks like the gel polish is a good product. For me, there is nothing better than a pedicure. I’m in love with that nail polish!!!! It’s now on my wish list! I’m really liking this new gel polish trend. The polish stays on longer and makes the nails look silky and smooth. I love gel polishes and I love that there are so many brands out there for at-home gel manicures! I rarely paint my nails because I always find that I chip it shortly after. I have never tried UV gels but they do sound interesting. This nail color is gorgeous and I like how nice your nails turned out. I want to try gel nails, I heard they last longer. UV Gels are new to me but would love to have one that lasts a month! How wonderful! Like you, I am always having chipped nail polish and having to touch up or re-do my polish so it looks nice. I have never used gel polish. Having to use a UV lamp means going out to buy or purchase one as I don’t have that on hand. An added expense it seems. Not sure how I feel about the gel polish. I would have to try and then compare it with a laquer polish which I find stays on and does not chip like others. IF you use a base coat and a top coat to seal the color polish, I find that it will last longer. Takes a little extra time to do but worth the effort. And it also stops the nail from staining from the color or dark polish. The gel polish looks heavy or thicker on the nail by the photo but looks nice. I may have to try the gel polishes to compare and see how I like it and how it does on my nails. My main problem with polishing my nails is that I always seem to smudge them before I give them time to dry!! uggggg. Had the gel polish done once it dont chip and stays on for days and days you have to remove it after awhile because you nail start growing and it dont look good. Never used gel polish before but no chips? I’m so trying this! Hi! do you know where can I buy it in NY? I need to buy it in a physical store, not online, because the place where I will be, doesn´t acept delivery.